The following offers a product overview of Grosvenor Casino and Games. For a detailed player's persepctive, please refer to OnlineCasinoUK's Grosvenor Casino review. Grosvenor has built up one of the most impressive high street business empires that the UK has ever seen by placing casinos all around the isles. After conquering the land based casino market they swiftly moved over to the online market, creating the Grosvenor Online casino. Online, they have tried to emulate many of their success concepts from land based casinos, offering a comprehensive selection of games that will keep even the pickiest gambler happy. The design and the graphics are exciting and well-worked - including a few parts where it looks like you are walking through a land-based casino. With such a trusted casino brand you can feel safe when doing transactions to and from your casino account. The overall feel of the online casino is that it is professional and with an excellently trained customer support staff there is not much more to ask for. If Grosvenor keep this up they will be well on their way to dominating the online casino market in the same way that they currently dominate UK land based casinos. Getting started with Grosvenor Casino is a very easy process because you are not required to download any additional software as games can be accessed through the website. All that is needed to start gaming is to register with Grosvenor and this took me no more than a few minutes to fill in all the standard registration forms. Overall, the time taken from the moment that the casino home page loaded up until I started playing my first game was no more than five minutes. Alternatively, you can download the software and play directly from your desktop. Once again, the initial set up was quick and took no more than a few minutes to get started. Like all online casinos, Grosvenor offers its new members a sign up bonus. Every new member will receive a £20 cash bonus upon signing up once all caveats are met. Where Grosvenor differs from other online casinos is that claiming the bonus is very straightforward. Some other casinos enforce restrictions on what games can be played to claim the bonus or insist that a new member has to wager a significant amount before the bonus is earned but Grosvenor is quite different. At Grosvenor you can play any game and wager the deposit just five times before receiving your bonus. I deposited £30 into my account and after a few games I was gifted another £20 by Grosvenor. You can also receive an additional £20 if you are a member of one of Grosvenor's real-life casinos. Grosvenor Casino is home to well in excess of 100 games which provide members new and old with a large amount of choice, covering a wide variety of genres. All of Grosvenor's games are split into the following categories: live games, casino games, slots, poker, jackpot slots, virtual sports and TV shows. The casino games, which features the likes of roulette, blackjack, baccarat, craps and more, features a number of different varieties of each game so members have a large amount of choice. New members of Grosvenor will find a set of games that both look and sound good and run smoothly. 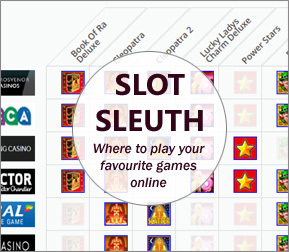 This is due to the presence of Playtech software - one of the leading companies in the online software gaming world. Grosvenor also offers members a 'live gaming' option, where you join a real-life table and croupier, making the casino experience all the more lifelike. As you would expect, depositing funds is a quick and pain-free process, enabling you to start gaming as soon as possible. Grosvenor Casino members can choose from a number of options when it comes to depositing their funds such as Visa or Mastercard credit cards, Delta, solo or maestro debit cards, and e-wallets such as NETeller, moneybookers and Ukash. All methods used to deposit funds are quick and secure but for convenience sake I decided to use my debit card and the funds were available to be used almost instantly. Withdrawals can be made just as easily and members can use the same options with the exception of Mastercard and Ukash, and have the option of being paid by cheque. It is worth noting that Grosvenor reserves the right to split any withdrawals across the available methods in accordance with their net deposit rules. So that the needs of its members are met, Grosvenor has a round-the-clock customer service programme which can be contacted one of four ways. Those members who clearly aren't in any hurry can write to Grosvenor but for those looking for a more swift response, email, phone and live chat options are also available. Naturally the phone and live chat options are the fastest but if you feel that your question might be a commonly asked one then you can use Grosvenor's FAQ section. In addition to the welcome bonus given to new members, Grosvenor also has a number of other promotions designed to pique the interest of its players. One such promotion is the chance to win a night in your local Grosvenor casino, where you and a friend will receive dinner and drinks, tuition from the house croupiers and a free £5 chip each to get you started. Players will also receive a loyalty bonus once a month, where the amount received is dependent upon how much you play. In essence, you get money back for gaming. Points are awarded for wagering certain amounts on certain games and at the end of the month the points are tallied up and from there the bonus is calculated. Grosvenor also has a VIP programme where members receive additional benefits including regular cash bonuses, bespoke hospitality and gifting at international music and sporting events, increased table limits on casino games and much more. Membership of Grosvenor's VIP club is at the discretion of the house and members must apply to see if they are eligible to join.